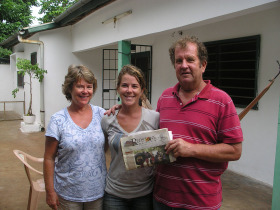 When we toured the village, we said "this is so interesting, it should be an ecotour!" Well, Tammy has done just that: arranged several ecotours. This brings one more small business into the Tsevie area. Becky decided not to bring her dog back to the US, but the carrier was used by some other PC volunteer. Tammy got a kitty, too. She said "it was stuffed into this cage with all these ducks, and I just had to bring it home." John and I realize that not only are we richer for the travel experience, we are stronger. We can travel to a place that is out of our comfort zone. We also realize how much we missed seeing the wildlife of Africa, like elephants and lions and monkeys. 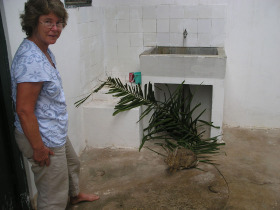 This isn't Tammy's fault, she offered us the option of going to Mole National Park in Ghana and we declined. But when we got home, a flyer offering a certain tour, arranged through the CU Alumni Foundation, came in the mail. We both looked at it at separate times, and then one evening looked at each other and said: "Let's go!!!" So next May we are off to Africa, this time on . . .
First post in the African trip series. Africa. Before we traveled to Ghana and Togo, I thought of it as a large dark continent, full of unknowns, unknowns that could be dangerous. Now I can put a name on the dangers, like unsafe transportation, diseases, poor health care support, poisonous snakes and ants, but I also know that west Africa is peopled with kind, helpful, hardworking, and fun-loving people. The interesting people we met made the travel worthwhile. In general, the people are laid-back and friendly, and have a nice slow pace to life, similar to other cultures in tropical climates, such as Hawaii. We never felt threatened, we did not find the locals to be angry or mad or violent. Quite the contrary. We just scratched the surface of learning about the culture of west Africans, and we liked it. I am so proud of my daughter for immersing her life amongst theirs, learning so much about their ways, and sharing with them some American ways, and helping them learn methods to improve their lives. I could delve into the issue of the abject poverty that we saw. Are they happy living in the conditions? Yes, mostly, it seems; at least they were not angry. But they have few opportunities to change how they live. Could they, should they? We have such a wealth of ways in which we can spend our days, spend our lives. If we get sick, we can get medical attention. We have freedom of choice and lots of choices. We may get angry at our government, but at least it is not corrupt at every level. I don't necessarily wish on the rich African culture the hectic, busy, consumer-goods-obsessed ways of Americans, but to me, never to have had the chance to study science, nor have a plethora of foods to choose from, nor be able to travel, nor have a daughter who can devote her life to whatever she chooses, nor have my son cured of cancer . . . I know where my heart is. I used to think it would be easy to help pull Africa out of poverty. Just start opening factories there, why not? There are a lot of people there who need work. Well, the infrastructure is just not there. 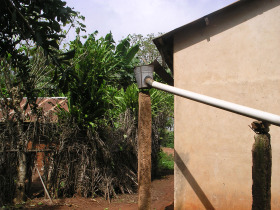 Roads, power, stable governments, sewage and trash systems; the issues are mindboggling. 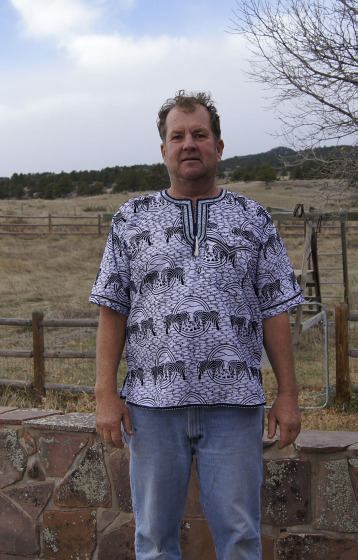 When we first got back from our trip, people asked us what we thought of Africa, and John and I both said "It's complicated." And to those who say "the US is becoming a third world country" we say "uh uh, no way near it". If that's what you think, travel to one, and you will know. We are glad we traveled to one, and especially that we traveled to west Africa. Our lives are a lot richer for the experience. Our last night in Togo. We left Tsevie in the early afternoon on Friday, right after the great tuna lunch at Tammy's friend's house. 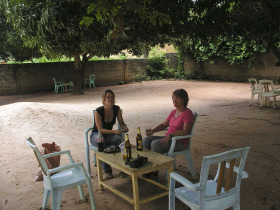 A taxi picked us up at Tammy's house and took us all the way to the Hotel Phoenicia in Lome. No more bush taxis for us! After we settled into our hotel room, we walked a couple blocks to the beach, and sat at a "bar" that was sheltered tables and chairs on the sand. As we sat and talked and ate a few snacks, hawkers kept coming by to sell us stuff. Tammy bought some DVDs. One guy was selling cigarettes and viagra. Yup, viagra. Later, we walked to a restaurant for pizza. We felt kind of guilty for abandoning the food of the local culture, but we were hungry for something other than rice and sauce. We wanted cheese! We had to ask the restaurant workers to turn down the music. I forgot to mention this before, but the Ghanaese like to play loud reggae music through bad speakers. I like music, but it's hard to hear over it when what you really want is good conversation. The Hotel Phoenicia had TVs, hot showers, and even wi-fi. They also had a restaurant and bar. 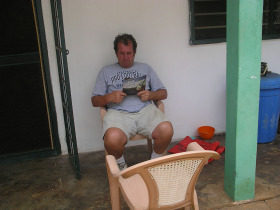 Our last night in Togo began a slow transition back to the creature comforts that John and I are so used to. We snuggled into the crisp sheets, cooled by a noisy but effective air conditioner. It's bittersweet, though. We know that tomorrow we have to say good-bye to Tammy. Our visit to the village. Tammy gave us a choice of several outings from Tsevie. We could have gone to a touristy spot to see waterfalls, and I think there was a place to see wild monkeys, but those both required longish tro-tro rides. So, we chose instead to visit a local village, just a couple miles away. As a PC volunteer, Tammy works with the women in several villages to help build their pottery businesses into profitable enterprises. She has taken groups of these women to Ghana to learn pottery techniques. She also teaches them better business practices, such as how to keep track of costs and income. She is encouraging the village women to increase their efficiency by renting a cart to carry the pots to market in one trip instead of taking several trips, carrying them on their heads. 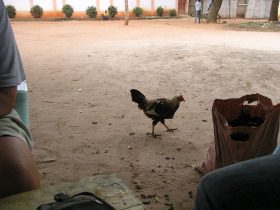 On Thursday, Tammy's friend came with us on the excursion to the village. She served as an interpreter, since not all the villagers speak French. We took a taxi to the village, although Tammy usually rides her bike. (The PC provides her with a bike, bike helmet, and a motorcycle helmet, since she is allowed to ride on motos in Tsevie.) The taxi's windshield was a mess of cracks. From the taxi, we saw women carrying large loads of pots on their heads, on their way to Tsevie. We stopped and Tammy said hi. We arrived at the village and were greeted by the pottery women. They brought out benches for us to sit on, we made introductions, and Tammy gave them gifts (mostly candy). One woman (sorry, I was unable to get the names!) stood out. She was tall and seemed quite smart and capable and was wearing an attractive red and black top. She took charge and led us through the village and demonstrated how the pots were made. Tammy, her friend, and John walking through the village. Home-cooked meals in Tsevie, part 2. The party at Tammy's led to several lunch and dinner invitations, as each family at the party wanted us to come over to their homes. So Thursday mid-day, Thursday evening, and Friday mid-day we were lucky to enjoy home-cooked meals. We learned that it is customary to take gifts when you visit. We had brought packages of candy and some T-shirts from the US (under Tammy's advice) and we gave them to our lunch and dinner hosts. On Thursday, lunch was at her host family's. 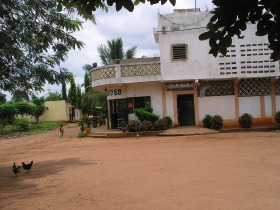 (Her "host family" is where she stayed during her first two months in Togo.) It was "fatty rice" - rice with some veggies and a lot of palm oil; it's another of Tammy's favorites. It was good. The family served us the meal, then left the room. This Togoese custom shows respect for your guests, according to Tammy. We did not stay long - another custom, she said, is not to linger after a meal. 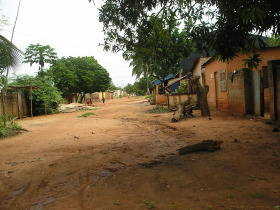 Often, people in Togo rest or sleep in the early afternoon when it is very hot. 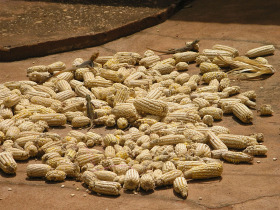 Two piles of corn drying in the courtyard of the host family. One pile is corn still on the cob, one is corn off the cob. 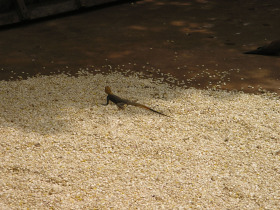 A lizard on the corn. Home-cooked meals in Tsevie, part 1. Our time in Tsevie was greatly enhanced by good, home-cooked meals. Tammy has been able to make friends with quite a few locals - partly because she speaks French so well - and her friendships enabled us to visit the homes of several local families. We learned the local cuisines and also some of the local culture. Wednesday was a slow day for me, because I woke up with some stomach issues, and slight fever and chills. That day, I hung out at Tammy's while John and Tammy made forays into town for various food stuffs and house repair items. Thursday, John woke up with the same issues I had, so we both started taking the antibiotic for dysentery that the doctor in the US had given us, and we felt better almost right away. But other than that, Tuesday, Wednesday, Thursday, and Friday were adventures into the local culture. This post and the next will focus on the food, and the one after that will focus on our trip to a local village. Tammy made us a couple fish and vegetable dishes, served with either rice or "pot". She would tell us "it's a simple meal to make" but each time, it seemed like she spent hours in preparation. The fish was smoked fish; smoking is a good way to preserve fish when you don't have refrigeration. The spice base for most of the dishes she prepared is a mixture of fresh garlic, ginger, and local chiles, put into a mortar and ground to a homogeneous mush. The vegetables are greens, local small eggplants, onions, and tomatoes. To make the "pot", we took the dried corn we had bought at the market to a local stall and they ground it in a big machine. She mixed the ground corn with water and cooked it, then put pieces of it in the vegetable/fish sauce. It's very good - we both liked it. On Wednesday, about ten friends of Tammy's came over for a dinner party. The group of friends included both locals and Becky, another PC volunteer. The main food item was Tammy's favorite local dish, called "fufu". The fufu was made from plantains and yams, although other combinations of starches can be used. The yams are huge, root-like vegetables that we saw sold all over Ghana and Togo. 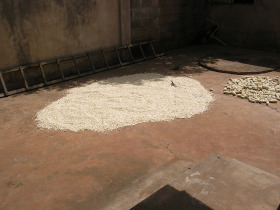 For fufu, these are peeled and then boiled. Then, they are put in a huge wooden bowl and pounded with a large mallet for about an hour. The whole process a couple hours. Traditionally, the men take turns doing the pounding, and the women move the mixture around under the mallet between pounds. When the pounding is finished, the fufu has a consistency of sticky mashed potatoes. Group photo - Tammy's party. The fufu was served in a sauce-soup-like mixture consisting of chicken, tomatoes, and other vegetables; it was seasoned with the same garlic-ginger-chile mixture Tammy used before. 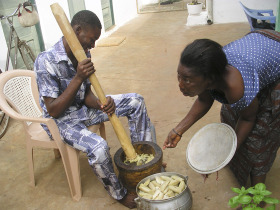 As was the "pot", people eat fufu with their hands, using it to scoop up the sauce mixture. Fufu isn't supposed to be eaten too late in the day, as it's considered "too heavy" for the digestive system. In fact, by soon after 6 pm, most families are home and have finished their evening meal. Just about everyone at the party had some sotobe, a distilled palm liquor. (I looked this up online, and according to Wikipedia, it's spelled "sodabe".) It's similar in taste to tequila, so John taught them to drink it as shots with lime and salt. 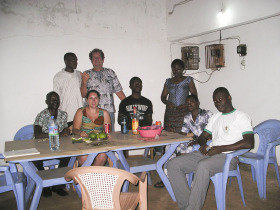 During so much of the time spent with locals, John and I were left out of the conversation, since we don't speak French. But the sotobe made the language issue less of a problem! Remember that I mentioned that we left some material at the tailor's to be made into outfits? Well, near the end of the party, the tailor came by and delivered a skirt for me and a shirt for John. He had them done in one day, and the total charge, including the material, for both outfits was less than $15 US! He did a great job! Next: Home-cooked meals part 2. 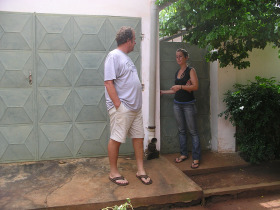 Tammy rents a house, or more like a "complex", in Tsevie. 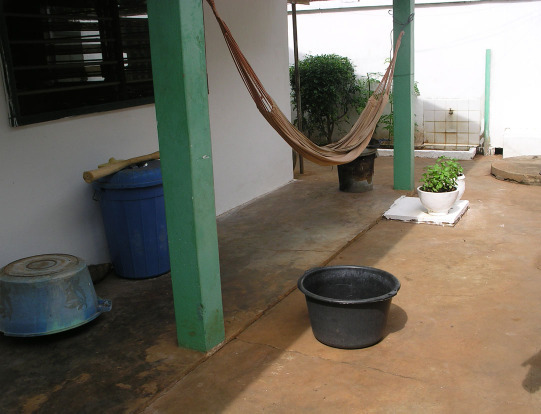 Apparently, a member of the Peace Corps (PC) has rented this same complex for some time - it changes hands as the volunteers start and finish their service. 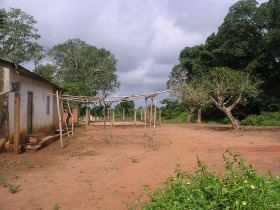 Since her place is so large, it is kind of a "home base" for other PC volunteers if they travel to Tsevie. 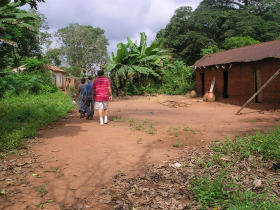 A lot of the Togo PC volunteers are stationed in villages, and sometimes need to come to the city, and they stay with her. Tammy's PC assignment is called: "Small Enterprise Development Program". She helps get local people set up small businesses, for instance, selling pottery. Her place is enclosed in a wall. 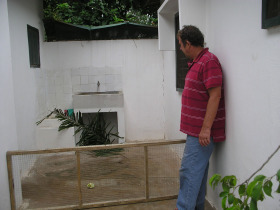 Inside the enclosure is the main house, a courtyard, and a long narrow building that has several rooms (including a toilet) and one covered but open area (for eating outside). 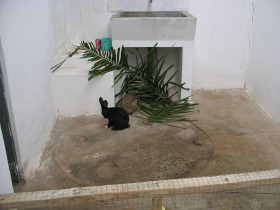 The rooms are used for storage and one is used for her bunnies! She has the cutest bunnies. 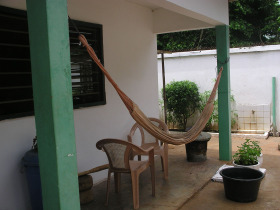 The hammock in the courtyard. The window next to it is the kitchen window. You can see the faucet in the planter next to the wall. Note the huge basil plant! John sitting next to the door to the house. The hammock is to his left. Two of Tammy's bunnies. The black one is the male. 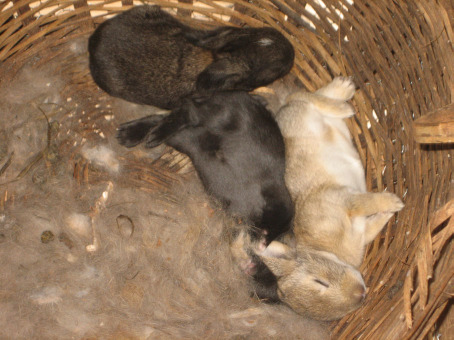 The third bunny is shy and didn't come out as much. That's me in with the bunnies. Behind me is the little room where they hide, sleep, and nest. John built this wire gate for the bunnies. When we got there, Tammy was keeping them locked in the little room, sometimes letting them run loose in the courtyard. But they ate all the plants she tried to grow, and made messes. So the gate allows them to get out in the fresh air so we could watch them run and play, and allows Tammy to have her basil and other plants. Lot's more! Be sure to click on "read more" below. Walking back from the market. We were kind of loaded down, and the heat makes you extra worn out (at least that's our excuse). So the journey back from the market to Tammy's complex took awhile. Tammy and John walking back to her house, through a park. Note the huge sack on Tammy's head. This cute little girl wanted her picture taken, and I was glad to oblige! Tammy said "Let's stop at the bar for a beer." We of course agreed! It's hot, and we are tired and thirsty. We sat in a shady area that is her favorite bar. The bar girl would come walking all the way out to us with our beers, usually "Flag" beer. Tammy and Patty at the bar. Note the bell on the table (it looks like an upside copper funnel). You use it to summon the bar girl for your next drink. This photo is taken from the table we were sitting at, looking towards the bar on the corner. Yes, those are chickens. Tuesday in Tsevie: First, to the market. We woke up in Tammy's pleasant, quiet "complex". She gathered breakfast for us, including biking to get baguettes, although sometimes she could get them from a vendor as he biked by. The bread here is much better than the sliced-from-square-loaf bread in Ghana. In Togo, luckily because of the historic French influence, "bread" is often "baguettes". She had a kind of room temperature cream cheese to spread on them, along with jam. And we had real, brewed coffee! 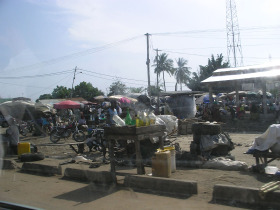 Tsevie has a "market" each day in the center of town. Monday is the biggest market day, but I found the Tuesday market to be just fine! We walked along the dirt streets to the town center. John and Tammy walking to the market. 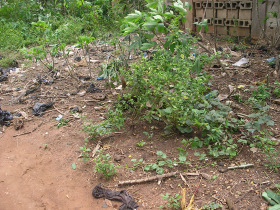 Note the lush tropical plants, as well as the piles of trash. The red clay streets turn into a gooey mess when it rains, and it rains often, although we were not there in the rainy season. 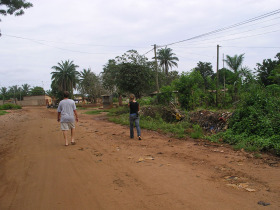 John and Tammy on the streets of Tsevie. Tammy is using a piece of charcoal to write a note to her friend on the doorstep of her friend's shop. She hasn't been able to contact her by cell phone. Close-up of trash. Sorry, but I want everyone to be very, very thankful to our own government for being able to provide us all with a structure for trash pickup. Please be nice to your local trashman, it's a very important job. And now for the good part. The "market" reminded me a lot of the "farmer's markets" that we have in the US. Locally grown produce and fish, as well as foodstuffs brought in by truck. The market is where the locals get the ingredients for dinner. Since many people do not have refrigerators in Tsevie, they shop each day. I am an admitted foodie, and I was in foodie heaven, just looking at all the interesting foods. I wanted to put down the camera and touch everything instead, and ask what it was! Oops, we are in a French speaking country. No quick easy answers to my queries, and we have to be careful to wash everything before we eat it. So look, but do not eat (yet!). 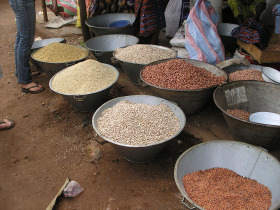 Containers of beans and corn at the market. Tammy bought some dried corn that she later had ground up to make a dish called "pot". I have a lot more pictures to show of the market - click on "read more" so you don't miss them! We plan to spend several days at Tammy's house in Tsevie, and since grocery shopping is limited there, Tammy and I walk to find a supermarket for olive oil, ground coffee, and jam. However, she had forgotten that supermarkets in Togo close from noon to 3 pm everyday, because that's siesta time. So we found a small market instead, then headed to the tro-tro station. Tammy decided on a "bush taxi" for the 22 mile trip to Tsevie. What's a bush taxi? Well, it's the lowliest form of a tro-tro. They are the most beat up vehicles, and they cram the most people in them. As I mentioned before, in Togo there is no rule as to how many people they can stuff into a vehicle. 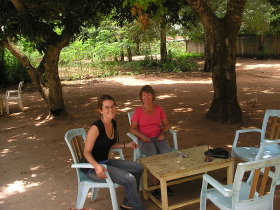 Tammy said "it's an initiation rite, all parents of Togo Peace Corps Volunteers have to ride in a bush taxi at least once." We say, "oh" and go along with her plan, not knowing what we are getting ourselves into. We were stuffed four people across in a seat, and flat bench seats were filled with people facing us. Our luggage was stuffed in back and the hatch tied with old rags. The side door was held closed with a rope. We took off, but the apprentice hung out the door and kept hawking "Tsevie!" to get more riders, although it seemed impossible to stuff one more bit of human flesh in that bush taxi. Of course the traffic was as crazy as usual. The often-used brakes squealed and barely stopped the taxi. 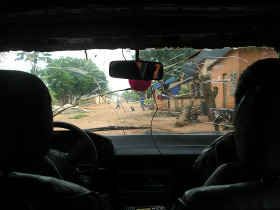 The windshield was broken in lots of places. Once the taxi slowed to a stop in front of a stand with a bunch of bottles on it, and the apprentice placed a funnel made from a plastic bottle into the gas tank - then poured petrol from a bottle into the tank. Finally we got to Tsevie (it took about an hour to go 22 miles) and popped out of that bush taxi quite gratefully, glad to be alive. Not in the mood for another taxi, we walked to Tammy's place even though it was several blocks from the station. Long, hot blocks on the red, clay-like dirt streets, laden with our suitcases. We arrived at 4 pm, having left Accra at 8:30 am. (It's about 107 miles from Accra to Tsevie.) We were very tired, but very happy to finally be somewhere comfortable and homey! Luckily Tammy had enough energy to make us a meal and get us some drinks. She is a great cook! She made us panini-style sandwiches and a green salad. We settled in to spend an evening of eating, drinking, talking, and watching DVDs on her TV. Here we at Tammy's, posing with the Lyons Redstone Review (a Lyons tradition). We spent a lot of time in her hammock! It was cooler outside than inside her house. John and Tammy at the gate to her "complex". 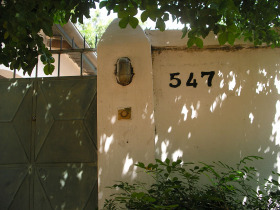 Her house and yard is surrounded by a wall, with a gate that is securely locked. 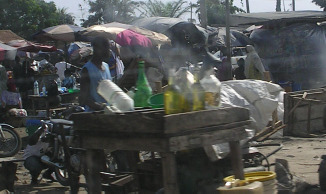 This is a common practice in cities in Togo. You thus have a secure courtyard and house, rather than just a locked house the way we do in the US. 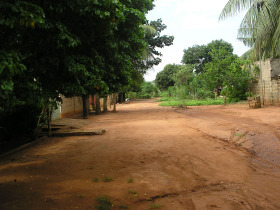 The street outside Tammy's complex. Another view of the street outside Tammy's complex. 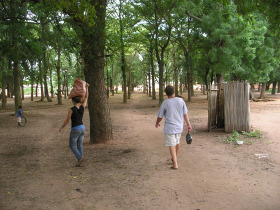 Next: To the market in Tsevie.